The purpose of this study is to further our understanding of dilemmas facing the third mission of universities. Through this dilemma-related information, we aim to provide paths for universities to reconcile these dilemmas and adopt a more holistic approach to university marketing. In so doing, we revisit “the shotgun wedding of industry and academia” (Hampden-Turner 1990, pp. 201–221). The dilemmas detected in this study revolve around two pairs, namely: “Highlighting intrinsic value of research vs. highlighting instrumental value of research” and “focusing on international scientific publications vs. focusing on popularization of science”. More than 700 verbal answers given by Finnish doctorates to one pair of open-ended questions were qualitatively content-analysed. As its main novelty, the study adopts dilemma approach and focuses on perceptions of the neglected group of doctorates who have exited academia. The study suggests that universities adopt a more holistic marketing approach by devoting more effort to strengthening stakeholder relationships and co-production and improving science communication and related incentives. Current research, innovation and higher education policies tend to emphasise collaboration between universities and surrounding society as a key policy for fostering innovation in the economy. Doctoral-level education, in particular, is seen as providing collaborative arrangements between non-university sector employers and universities (e.g. Thune 2009; Haapakorpi 2017; Kivistö et al. 2017). Prior literature on marketing in the university context has focused on student marketing and prospective and current students’ views on higher education services, organisations and brands (e.g. Bock et al. 2014; Koris et al. 2015). This is not surprising, as universities naturally wish to maintain or increase enrolment of competent students (e.g. Obermeit 2012). Indeed, while the emphasis in academic literature on marketing in the university context has been on student marketing, interactions with other stakeholder groups, such as alumni and the business community, have attracted less attention. However, in addition to teaching, universities have two other missions: the generation of knowledge (research) and the application of knowledge (the third mission) (e.g. Mugabi 2014). The third mission can be defined as “all activities concerned with the generation, use, application and exploitation of knowledge and other university capabilities outside academic environments” (Molas-Gallart and Castro-Martínez 2007, p. 321). Yet, teaching and research are more established, studied and understood than the third mission (Mugabi 2014). Thus, we questioned whether further understanding of the third mission and possible dilemmas related to its implementation could provide answers to increasing pressures for universities to contribute to the socio-economic development of societies (e.g. Pinheiro et al. 2018). Universities in Finland are particularly responsive to government reforms, as they are publicly owned. All Finnish universities are publicly funded though performance criteria determined by the Finnish Ministry of Education and Culture (e.g. Kallio et al. 2017). It is widely believed that doctoral graduates represent a key element for innovation and the generation of new knowledge (Haapakorpi 2017; Kivistö et al. 2017). These arguments suggest that doctorates may offer industry either the most up-to-date scientific knowledge they have produced or their capabilities in producing such knowledge, resulting in knowledge spillovers (Lee et al. 2010). Doctoral graduates also serve as channels of knowledge transfer between universities and non-university employer organisations. Therefore, recruitment of doctoral students and doctorates is an important motivation for non-academic employers to interact with universities (Thune 2009; Haapakorpi 2017). Against this backdrop, examining universities’ third mission from the perspectives of doctorates who have exited academia and, thus, understand work life both inside and outside academia should be useful. This group also represents universities’ alumni, one of their key stakeholder groups (e.g. Pedro et al. 2018). However, achieving a university’s third mission is not without its problems. For example, Hampden-Turner (1990, pp. 201–221) discussed the gulf between academia and industry in his book chapter “Shotgun wedding: industry and academia”, which identified dilemmas in the industry–academia collaboration in the Canadian context. In this study, we revisit Hampden-Turner (1990, pp. 213–215) and the ‘old’ core dilemma: “The enhancement and protection of university’s basic mission to teach and develop ‘pure’ knowledge vs. the need to apply its knowledge so as to help the whole nation compete economically”. In so doing, we respond to Suomi et al.’s (2014) call for more research utilising the strategic dilemma approach to resolve management challenges in higher education (see also Hampden-Turner 1990, 2009). We also acknowledge Gera’s (2012) suggestion, in his conceptual study, that more research on barriers to knowledge transfer between academia and industry should be acquired from different cultures and systems. Given the above, the purpose of this study is to further our understanding of the dilemmas facing universities’ third mission. Through this dilemma-related information, we aim to provide paths for universities to reconcile these dilemmas and adopt a more holistic approach to university marketing. To accomplish this, we qualitatively content-analyse an extensive set of data gathered from Finnish doctorates who have exited academia. In this study, we take a holistic perspective and examine knowledge transfer between academia and surrounding society, including private, public and third sector organisations. Accordingly, we prefer the term ‘surrounding society’ instead of ‘industry’ in our elaboration (c.f. Hampden-Turner 1990). Finland offers a beneficial context for the study, as the Finnish government is increasingly requiring universities to engage in knowledge transfer with surrounding society (e.g. Nikunen 2012; Stenvall and Laitinen 2015). Thus, this study contributes to the intersection of academic literature on higher education management and university marketing by revisiting and detecting dilemmas in fulfilling universities’ third mission and discussing ways to adopt more holistic approaches to university marketing. As its main novelty, the study adopts dilemma approach and focuses on an understudied area by gathering empirical data from doctorates who have exited academia and examining their perspectives on universities’ third mission and knowledge transfer. Despite this group’s key role in knowledge transfer processes through their movements between universities and surrounding society, little is known about their perceptions. The rest of the article is organised as follows. Firstly, universities’ third mission and closely aligned concepts are discussed. Secondly, the academic literature on marketing in the context of universities is reviewed. Then, the dilemma approach is introduced. Thereafter, the data gathering and methods of analysis are described, and the empirical results are reported. Finally, the study ends with a discussion, conclusions, limitations and suggestions for future research. Universities and their personnel face major changes, including new forms of control and measurement (Kallio and Kallio 2014; Kallio et al. 2016; Kivistö et al. 2017), increasing competition (e.g. Suomi 2014), globalisation (Hemsley-Brown and Oplatka 2006) and demands from a wider range of stakeholders (Chapleo and Simms 2010; see also Ćulum et al. 2013). University–industry relations have also changed significantly. Indeed, the rise of third mission activities, particularly knowledge transfer, has become an increasingly significant strategic issue for universities, politicians and policy-makers alike (Shore and McLaughlan 2012). Universities’ third mission has been described as social, enterprising and innovative activities that universities perform in addition to teaching and research tasks (Zomer and Benneworth 2011, as cited in Loi and Di Guardo 2015). Relations among universities, industry and government have been described by the triple helix thesis, which suggests that universities can play an enhanced role in innovation in increasingly knowledge-based societies (Etzkowitz and Leydesdorff 2000). New forms of knowledge production have been described with the following simplification: Mode 1 vs. Mode 2, where Mode 2 represents new forms of knowledge production emerging alongside the traditional Mode 1 (Gibbons et al. 1994). Within Mode 1, the paradigm of scientific discovery, problems are set and solved largely in the disciplinary context by specific academic communities. Conversely, in Mode 2, the new paradigm of knowledge production, knowledge is produced in the context of application. According to Nowotny et al. (Nowotny et al. 2003, p. 186), “[t]his is different from the process of application by which ‘pure’ science, generated in theoretical/experimental environments, is ‘applied’; any technology is ‘transferred’; and knowledge is subsequently ‘managed’”. Mode 1 is disciplinary and characterised by a hegemony of theoretical or experimental science, an internally driven taxonomy of disciplines and the autonomy of scientists and their host institutions, the universities. Mode 2, in contrast, is transdisciplinary, reflective and characterised by heterogeneity in terms of the skills and experiences people bring to it. It is socially distributed and subject to multiple accountabilities. Moreover, Mode 1 is hierarchical and has a tendency to preserve its form, whereas Mode 2 is non-hierarchical and transient (Gibbons et al. 1994; Nowotny et al. 2003). Mode 1 and Mode 2 seem to be two extremes and, while attained simultaneously, they generate a dilemmatic situation similar to that described by Hampden-Turner (1990, pp. 213–215): “The enhancement and protection of university’s basic mission to teach and develop ‘pure’ knowledge vs. the need to apply its knowledge so as to help the whole nation compete economically”. In addition, with respect to Mode 2, scholars have argued that academics’ engagement with non-academic stakeholders from surrounding society involves knowledge co-production, rather than simple knowledge transfer from the former to the latter (Rossi et al. 2017; see also Hampden-Turner 1990; Osborne and Strokosch 2013). According to Tranfield et al. (2004), the co-production model depends on the notion that best practice lies in a synthesis of academic research, practitioner experience and professional practice (see also Hampden-Turner 1990). In addition, it has been suggested that academics and practitioners can begin to co-create management knowledge through joint “systematic review” (Tranfield et al. 2004). In relation to knowledge transfer, Gera (2012) concluded that the managerial knowledge produced in universities has been criticised as too ambiguous, abstract and incoherent to help practitioners in decision-making. Researchers have been criticised for their academic writing conventions, abstract research orientation and different worldviews. Gera (2012) argued that successful application of knowledge requires not only the transfer of knowledge, but also its effective adoption and utilisation. It should be noted that alliances between researchers and industry for knowledge creation only partly answer the problem of knowledge transfer, as adoption and utilisation of research outcomes requires further contextualisation and internalisation that are not possible without active practitioner experimentation and adaptation. Gera (2012) argued that gaps between academia and practitioners can be overcome through knowledge management, information technology and human resource practices aligned with organisation-initiated innovation and knowledge transfer (see also Tranfield et al. 2004; Shore and McLaughlan 2012). Universities have a wide range of stakeholder groups and reasons for adopting a marketing orientation (Suomi 2015). For example, universities wish to attract competent students (e.g., Soutar and Turner 2002; Guilbault 2016), enhance student retention and loyalty (Nguyen and LeBlanc 2001; Gattermann Perin et al. 2012) and attract and retain competent personnel (e.g. Whisman 2009). Marketing research in the university context has also focused on co-production/co-creation, but has typically examined co-production between a university and its students (e.g. Ng and Forbes 2009; Dollinger et al. 2018). However, universities have other pertinent stakeholders, such as governments, foundations, accreditation organisations, competitors, media, business community and local public, with whom to maintain and develop relationships (Kotler and Fox 1995). However, our literature review reveals that academic literature on marketing in the university context has typically concentrated on students’ behaviours and choice of university, as well as marketing efforts targeted towards prospective students (e.g. Alves and Raposo 2010; Bartkute 2017), which represent university’s first mission (teaching). The other two missions, research and the third mission, have attracted much less attention in the academic marketing literature. 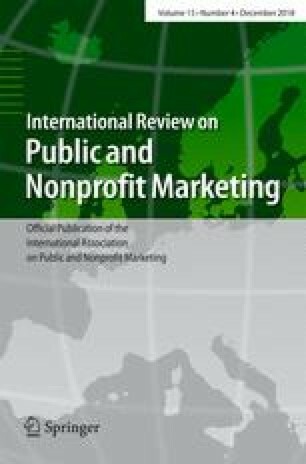 There is a well-established research area called marketing of higher education, and international academic marketing associations and conferences have special interest groups devoted to the marketing of higher education (see e.g. Academy of Marketing 2018; American Marketing Association 2018). There is also a journal focusing particularly on this field: Journal of Marketing for Higher Education. However, as its name suggests, this research area has concentrated on the marketing of higher education organisations and educational services to students (see also e.g. Hemsley-Brown and Oplatka 2006). This provides a somewhat limited view of marketing in the university context, as the university stakeholder environment is particularly complex (e.g. Kotler and Fox 1995; Chapleo and Simms 2010), as is that in the wider public sector (e.g. Wæraas and Byrkjeflot 2012). At the same time, marketing to a wider range of stakeholders is expected to become increasingly important, as there is increasing pressure on public organisations to secure their survival and ensure the legitimacy of the sector. Legitimacy and stakeholders’ trust are particularly important in the public sector (e.g., Leijerholt et al. 2018). Thus, we argue that universities would benefit from a more holistic marketing approach targeting all relevant stakeholder groups and viewing universities not only as educators, but also as research producers and partners in societal development with private, public and third sector organisations. One important university stakeholder group is alumni. Enhancing the alumni–alma mater relationship is important because alumni may provide valuable feedback for the university and act as partners in education activities. Alumni typically value a university’s quality and image and may actively contribute to the formation of this image, thus acting as “brand ambassadors”. They may also contribute financially to their alma mater and employ graduates, thereby continuing to act as consumers of universities’ educational product (Pedro et al. 2018; see also Stephenson and Yerger 2014). Thus, alumni can be considered important partners in implementing universities’ third mission. Hampden-Turner’s (1970, 1981, 1990, 1999, 2009; Hampden-Turner and Trompenaars 2015) extensive work on the dilemma approach over five decades illustrates the prevailing dilemmas of the Finnish university sector in delivering its third mission. Work by Kangaslahti (2007); Kuoppakangas et al. (2013); Kuoppakangas (2014); and Hytti et al. (2015) explores the use of the dilemma approach in organisational changes in the public sector. Furthermore, Suomi et al. (2014) used Hampden-Turner’s (1970, 1981, 1990, 1999, 2009) dilemma approach to scrutinise reputation management in the context of higher education. However, with one exception (Hampden-Turner 1990), prior research has not focused on dilemmas in university–industry collaboration, and no studies have examined this topic from the perspective of doctorates who have exited academia. Dilemmas are more than policy options, as Pollitt and Bouckaert (2011) discussed, since options can be decided based on facts and may not be subject to competing values. Following Smith and Lewis (2011) and Carlson et al. (2017), we consider dilemmas to be distinct from paradoxes. Dilemmas are not necessarily paradoxical, since a paradox assumes that one choice invalidates the other, whereas, in a dilemma, both options may be desirable, necessitating a reconciliation of competing values (Hampden-Turner 1990). Building on Hampden-Turner’s (1990) definition, dilemmas are mutually exclusive though desirable (and/or undesirable) options, which are often the result of conflicting or contradictory values held by individuals or organisations, deciding between which may result in tension and dispute. Suomi et al. (2014, p. 469) found “excelling as a teacher vs. excelling as a researcher” as a dilemma pair in the university context. While some researchers, such as Storey and Salaman (2009) and Pollitt and Bouckaert (2011), have suggested that avoiding dilemmas is important, others (e.g. Hampden-Turner 1970, 1981, 1990, 2009; Suomi et al. 2014; Kuoppakangas 2014; Hytti et al. 2015) have argued that discourse around dilemmas promotes value clarification and may result in their reconciliation: that is, their resolution. Dilemma reconciliation is an ongoing strategic process among both organisations and individuals (Kuoppakangas 2014). We argue that dilemmatic situations are an opportunity to avoid collision, either–or solutions or plain compromise, all of which result in winners and losers (see also Rittel and Webber 1973). 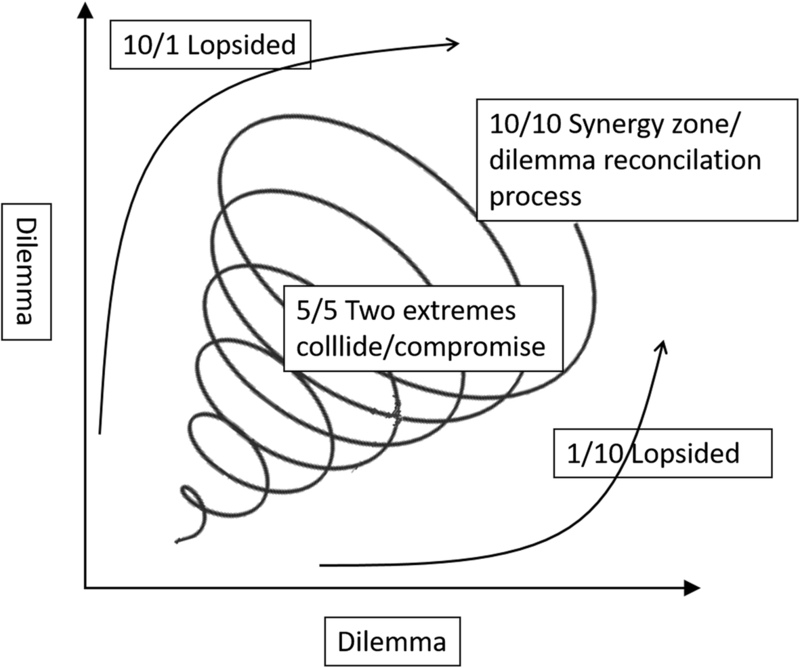 Figure 1 illustrates Hampden-Turner’s (1990, 2009) approach to reconciling dilemmas by combining competing values to produce added value or value redefinition rather than collision. Figure 1 demonstrates how the two opposing values creating the dilemma pair (i.e. “excelling as a teacher vs. excelling as a researcher” Suomi et al. 2014, 469), are placed on two axes instead of polarised on two different ends of line segments. The 5/5 compromise is not the target in resolving the dilemmas. 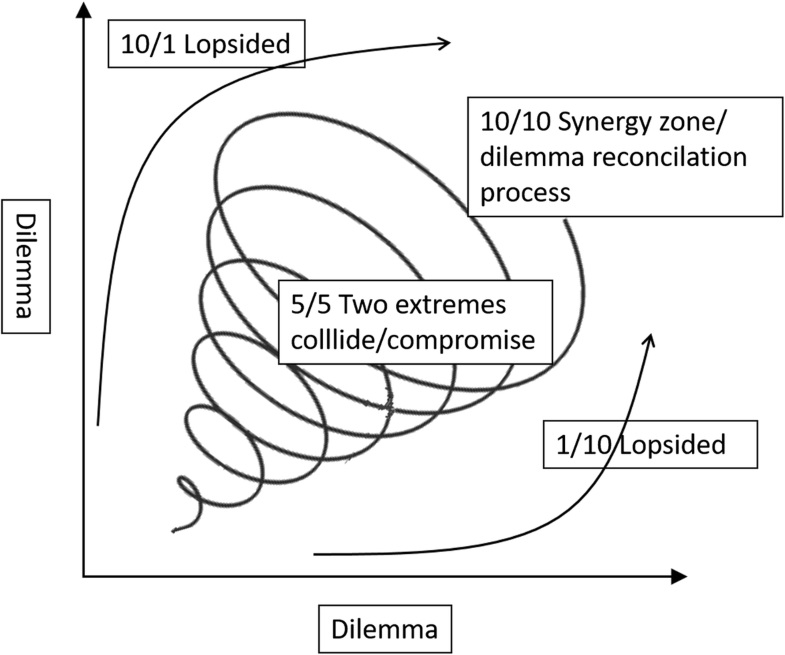 Instead, to avoid collusion, the two axes with a waving arrow are helically drawn towards the reconciliation target of 10/10 synergy, rather than the either–or 1/10 or 10/1 options (Hampden-Turner 1990; Kuoppakangas 2014; Kuoppakangas 2015). The synergy-zone 10/10, in other words the reconciliation of the dilemma pair “excelling as a teacher vs. excelling as a researcher”, is combination of both values and called “Researching into teaching” as detected by Suomi et al. (2014 p. 471). This could be done, for example, by applying knowledge and the findings gained from research projects more fully in the teaching to enhance synergy. It is important to note that dilemma avoidance leads organisations and individuals to choose between options either by not referencing values (e.g. “excelling as a researcher”) or by privileging one set of values over another (e.g. “excelling as a teacher vs. excelling as a researcher”; Suomi et al. 2014, p. 469). The perspective in Fig. 1 suggests that, in the context of demanding change, the two agents discussing their values may address colliding dilemmas by reconciling these values and finding synergy in combining both values, for example, into “Researching into teaching” resolution (Suomi et al. 2014 p. 471; Hampden-Turner 1990). Transparency and seeking understanding while learning why others hold their values are crucial in communication. Thus, in such a setting, values may become both separate and connected (Suomi et al. 2014). Making sense of values and why they might clash aids in (re)-negotiating meanings. Placing the colliding values in the practical context of problem-centred and problem-solving discourse enhances the reconciliation of dilemmas. In Hampden-Turner’s (1990, pp. 201–221) book chapter “Shotgun wedding: industry and academia”, he illustrated a dilemmatic case of “[t]he university and its partners” in Canada in 1987. He explored how government and business could better relate to universities and vice versa in terms of knowledge transfer. Hampden-Turner (1990, pp. 213–215) found and labelled the core dilemma as “[t]he enhancement and protection of university’s basic mission to teach and develop ‘pure’ knowledge vs. the need to apply its knowledge so as to help the whole nation compete economically”. The comparable pair in this core dilemma, which is revisited in the current study, was later named Mode 1 and Mode 2 by Gibbons et al. (1994), as introduced earlier in this study. With regard to the detected dilemma, Hampden-Turner (1990, pp. 201–221) described how the two opposing values of ‘pure’ and ‘applied’ knowledge have been placed at extreme ends of a pole, creating a dilemma. Hampden-Turner (1990) argued that the roots of the dilemma lie in two different organisational missions and cultural realities. In addition, he argued that knowledge is becoming more complex and can grow further when it is shared, rather than kept in individual academic experts’ “ivory towers”. Furthermore, Hampden-Turner (1990) suggested that surrounding society will “reap more from the universities if it sows more and will sow more if it is helped in its reaping” (p. 214). He also argued that universities need to re-evaluate the value of ‘pure’ knowledge and to not overdo it. For example, in the hard sciences, laboratories are needed for carefully controlled experimentation. However, most of the subjects addressed by the soft sciences are “events in the wider world” (Hampden-Turner 1990, p. 215). Such matters can be simulated at universities, but the isolation may result in loss of significance; thus, these disciplines may benefit from testing their suppositions in practice or, especially, from co-producing with other sectors. At the time of the detection of a dilemma, “[t]he enhancement and protection of university’s basic mission to teach and develop ‘pure’ knowledge vs. the need to apply its knowledge so as to help the whole nation compete economically” (Hampden-Turner 1990, pp. 213–215). Hampden-Turner (1990) also discussed how universities had been caught between the conflicting attitudes of policy-makers claiming that universities are “free” (p. 210) to have academic freedom (see also Kallio et al. 2016). Thus, though governments cannot interfere in what is taught and discovered by research at universities, they expect to receive value from their subsidies. This approach catches universities in a “double-bind” situation, leading academics to feel trapped (Hampden-Turner 1990, p. 210). Thus, Mode 1 and Mode 2 (Gibbons et al. 1994) resemble the ‘old’ core dilemma detected by Hampden-Turner (1990). In this study, we build on Hampden-Turner’s (1970, 1981, 1990, 1999, 2009), and Hampden-Turner and Trompenaar’s (2015) work of five decades to further explore this core dilemma. The data for this study were collected through an online survey as a part of a larger research project in Finland in 2018. It focuses on how and why academics exit universities in networked knowledge societies. The survey questionnaire was first tested and then revised according to feedback. Thereafter, an invitation to participate in the survey was sent to 4442 respondents (after removing 189 mistakes). One reminder was sent to attract more respondents. Altogether, 1226 respondents (28%) answered the survey. In the current study, we concentrate on verbal answers to one pair of open-ended questions: How could the information and know-how produced in universities be better transferred to working life and wider society? and How could information and knowhow produced outside universities be better transferred to universities? (N = 720). As the pair of questions show, we were interested in knowledge transfer both ways: from academia to surrounding society and vice versa. We did not limit the question to industry or business, as we were interested in knowledge transfer between academia and other public and third sectors, as well. The respondents represented the following disciplines: natural sciences, technology, medicine and health science, agriculture and forestry, social sciences and others. The data analysis began with a reading of all the answers to form general view of the data. Then, the more detailed data analysis started. The qualitative content analysis was guided by the dilemma approach (e.g. Elo and Kyngäs 2008) and, particularly, Hampden-Turner’s (1990, p. 213–215) dilemma: “The enhancement and protection of university’s basic mission to teach and develop ‘pure’ knowledge vs. the need to apply its knowledge so as to help the whole nation compete economically”. Thus, the study adopted abductive logic (e.g. Dubois and Gadde 2002), as it revisited and redefined existing framework, while empirical material took more central role (e.g. Coffey et al. 1996). The data analysis revealed two themes (Elo and Kyngäs 2008) as sub-dilemmas of the above-mentioned dilemma: 1) intrinsic value of research vs. instrumental value of research and 2) international scientific publications vs. popularisation of science. It also identified three themes bridging the gulf between academia and industry and, thus, providing paths for reconciling the detected dilemmas: 1) towards stronger stakeholder relationships, 2) towards co-production with and by stakeholders and 3) towards effective science communication and related incentives. To validate the findings, we present authentic quotations from the data (Silverman 2001). The quotations have been translated from Finnish to English. To ensure the respondents’ anonymity, the extracts are labelled with number running consecutively from 1 to 26. Our starting point was to revisit the core dilemma “[t]he enhancement and protection of university’s basic mission to teach and develop ‘pure’ knowledge vs. the need to apply its knowledge so as to help the whole nation compete economically” discussed by Hampden-Turner (1990) in his book chapter “The shotgun wedding: industry and academia” (pp. 201–221). The two identified sub-dilemmas connected to the core dilemma are presented next. Respondents saw international scientific journals as a problem for university knowledge transfer, as they are typically accessible only to university personnel and students due to their vast number and the expense of each subscription. Respondents also underlined that the current Finnish university funding model—and, accordingly, faculty members’ performance evaluations—does not support knowledge transfer. Respondents considered it problematic that the popularisation of science is not really rewarded and does not advance one’s academic career, but vice versa. The data analysis revealed three wider themes potentially bridging the gulf between academia and surrounding society and, thus, reconciling the core dilemma (Hampden-Turner 1990) and the two sub-dilemmas. These are presented next. Many respondents discussed the need for universities to put more emphasis on developing stakeholder relationships. They also expressed the need for better identification of central stakeholder groups. Particularly, the alumni–alma mater relationship was seen important for successful knowledge transfer between university and its stakeholders in surrounding society. Doctoral degree holders’ employment outside academia was also regarded as increasing knowledge transfer. Respondents advised that universities should better prepare students for work life after graduation and provide career coaching for career planning, identifying one’s competencies and communicating them. Respondents pointed out that, since knowledge cannot be easily transferred from academia to surrounding society (or vice versa), it should instead be co-produced (see also Trencher et al. 2017). It was argued that funding parties should better consider the usability of research results when making funding decisions. Respondents also proposed that academics should discover what kind of knowledge and knowhow stakeholders outside academia expect and then aim to co-produce it with them. Therefore, stakeholders from outside academia should be actively involved in preparing research plans and implementing research through collaborative and inclusive methods. However, the respondents noted that academics often lack time for collaboration with companies and that acquiring projects increases one’s workload without additional compensation. Thus, the respondents supported a wide range of low-threshold events for changing ideas, such as science cafes, contests for research ideas, and seminars in which students and researchers could introduce themselves to people from the business world. Respondents commented that job rotations and transfers of people from academia to surrounding society would enhance knowledge transfer. They also stressed the power of networks. Respondents also reflected that the exchange of people among sectors should be easier than it is currently. People bring their networks and knowledge with them; thus, “[i]t should be easier to work in industry or the public sector for a bit and then return to academia, or vice versa” (18). However, doctorates’ reputations outside academia were seen as somewhat problematic and involving prejudices of academics being in “ivory towers”. It was felt that the value of a doctoral degree should be better understood outside academia, which could increase doctorates’ employment outside academia. Various efforts, such as Podoco (Post-Docs in Companies), a joint initiative of universities, industry and foundations in Finland, were recognised as beneficial in matching doctoral degree holders and companies to foster the transfer of theory to practice (Podoco 2018). Many respondents held the view that more could be done together with firms and other organisations outside academia. For example, there could be more research and development projects, particularly those co-designed from the start with partners outside academia. In addition to research projects, universities could increase collaboration by employing more visiting lecturers and trainers from the business world and ministries and by helping students and staff build contacts. Moreover, collaboration with stakeholders outside academia in developing course contents was thought to have potential to add value and enhance mutual knowledge transfer. However, inviting visiting lecturers from outside academia requires resources. Initiatives like Professors of Practice were regarded as bridging the gulf between academia and surrounding society. It was also suggested that Open Universities and updated training could be utilised more widely by employers outside academia to educate their employees, which would also help bridge the gulf. In science communication, the respondents advocated different social media platforms, such as online social blogs and Twitter. They also suggested that TV news, current affairs programmes and documentaries could deal with research results more regularly. Finally, they argued that science communication and marketing could play a central role in altering employers’ prejudices related to academia and researchers. Researchers themselves could also learn how to better open up their competencies. In addition, science days, mobilisation to outside academia and open seminars were referenced as potential ways of bridging the gulf between academia and surrounding society and paving the way for more holistic university marketing. Respondents also discussed the third mission and knowledge transfer in relation to university funding schemes and academics’ performance evaluation: “Relevance, the usability of [research] results and partnerships should be taken as a part of the university funding scheme” (23). Indeed, in the current Finnish performance system, the number of study credits and degrees, as well as the amount of external funding and the number of publications, have become the key performance indicators in university funding schemes. University employees’ salaries are increasingly determined by performance evaluations (Kallio et al. 2017). In Finland, academics’ performance evaluations are linked to the Publication Forum Project (henceforth, JUFO) of the Finnish Learned Societies, which has created a system for evaluating the quality of publication channels, particularly scientific journals. Some of the respondents deemed the JUFO project problematic with respect to the popularisation of research because it encourages university employers to measure employees’ performance based on the JUFO level of their publications, even though, originally, JUFO was aimed at macro-level discussions of large publication volumes and, therefore, is not suited for the evaluation of individual researchers’ merits (Publication Forum 2018). Thus, the respondents felt that publishing in Finnish outlets, professional magazines and outlets intended for the general public was not really valued. Further, it was said that current goals seem to emphasise quantity over quality (see also Kallio et al. 2017). As one of the respondents noted, it may help if: “popularisation of science would be supported by the [academics’] pay system, and it would be noted in recruiting processes” (24). The purpose of this study was to further our understanding of dilemmas facing the third mission of universities. Through this dilemma-related information, we sought to provide paths for universities to reconcile these dilemmas and adopt a more holistic approach to university marketing. The starting point of the study was to revisit “the shotgun wedding of industry and academia” introduced by Hampden-Turner (1990, pp. 201–221). In this, we adopted a holistic perspective, as we examined knowledge transfer between academia and surrounding society, including private, public and third sector organisations. It was also acknowledged that Mode 1 and Mode 2 (Gibbons et al. 1994) closely resemble Hampden-Turner’s (1990) earlier findings. The current study detected two sub-dilemmas underneath the core dilemma discussed by Hampden-Turner (1990, p. 213–215): “[t]he enhancement and protection of university’s basic mission to teach and develop ‘pure’ knowledge vs. the need to apply its knowledge so as to help the whole nation compete economically”. The following briefly discusses these sub-dilemmas and suggested reconciliation processes. According to Hampden-Turner (1990), reconciling sub-dilemmas may aid in resolving the core dilemma, and vice versa (Kuoppakangas et al. 2013). Sub-dilemma 1, titled “Highlighting the intrinsic value of research vs. highlighting the instrumental value of research”, is close to what Hampden-Turner (1990) detected. The leading mission of a university is to educate by building on ‘pure’ knowledge from basic research discoveries. This is also in line with the Humboldtian ideas (Välimaa 2012) of academic freedom and opposing market-driven objectives. Applied research supplies the market-driven demand; however, education is the economy’s “seed-base” (e.g. Hampden-Turner 1990, p. 208; Haapakorpi 2017). Indeed, Hampden-Turner (1990, p. 209) argued that ‘pure’ research is the source of what is applied, noting, “block the spring and you will lose everything”. Our findings imply that, currently, critics of academics seem have same tone as critics in the 1990s in terms of requests for greater efficiency and engagement in knowledge transfer (Hampden-Turner 1990; Kallio et al. 2016; Haapakorpi 2017). Yet, academia needs to have a clear purpose: a mission of its own; otherwise, it risks being used by others as an “instrument” (Hampden-Turner 1990, p. 216). However, overemphasising the value of ‘pure’ knowledge sets universities’ basic mission on an opposing extreme from applied knowledge, and vice versa (see also Kallio et al. 2016). Furthermore, although the current study found universities’ third mission and collaboration with other sectors to be important, respondents also emphasised researchers’ ability to conduct autonomous research according to their academic values. The potential value of basic research to surrounding society is hard to predict in advance (see also Kallio et al. 2016; Ylijoki and Henriksson 2017). The study further found that the conflicting idea that the academic value of ‘pure’ research is diminished when it is applied in the search for creating commercial wealth still prevails. While Hampden-Turner’s (1990) findings are still valid, it should be noted that universities’ collaborations with surrounding society can take many forms, which may not always contribute to commerce. For example, collaboration may involve assisting governments with social and healthcare programmes (see also Kuoppakangas 2014) or planning sustainable products and services. Such collaborations may entail positive media attention and, with the support of effective university marketing, have a positive effect on perceptions of academia and researchers among employers outside academia (see also Haapakorpi 2017). In addition, as detected in this study, stronger relations with alumni can benefit knowledge transfer between universities and other sectors (Pedro et al. 2018; see also Stephenson and Yerger 2014). However, attention must be paid to preparing doctoral students for work-life competencies in addition to their academic substance and methodological studies; otherwise, they may lack the ability to open up the transferable skills gained during their studies, which may hinder their employability outside academia (e.g. Haapakorpi 2017; Kivistö et al. 2017). Traineeships during doctoral studies and academics’ job rotation to other sectors (and vice versa) would benefit knowledge transfer, as would inviting experts from other sectors to serve as visiting lecturers at universities. However, such job rotations may involve challenges, as business and industry partners may value their time via monetary incentives and fast results, while academics may find it difficult to maintain and reach academic results measured through performance evaluations (Kallio et al. 2016; Kivistö et al. 2017) if absent from their jobs at universities. It seems that Hampden-Turner’s (1990) and, later, Hampden-Turner and Trompenaars’ (2015) conclusions are still valid: A shared view of what a closer partnership with other-sector organisations could achieve for a university, for business and industry and for nations can transcend present disputes, resulting in fruitful and genuine collaboration. “A ‘virtuous circle’ of sowing and reaping, with each increasing together in agreed proportions, could help to develop both the basic mission of universities and the volume of expert applications” (Hampden-Turner 1990, p. 215). Accordingly, “towards stronger stakeholder relationships and co-production” could be considered the reconciliation process for sub-dilemma 1: “highlighting the intrinsic value of research vs. highlighting the instrumental value of research”. Indeed, a few recent studies have examined co-creation/co-production in the university context; however, thus far, this area of study has focused on co-production between universities and their students (e.g. Ng and Forbes 2009; Dollinger et al. 2018). The current study expands the view to include co-production with and by stakeholders from outside academia by reporting the perceptions of doctorates who have exited academia. With regard to marketing, it would be more useful to adopt the concept of university marketing than marketing of higher education, as the former better considers a university’s other two missions beyond teaching (namely, research and the third mission) and a university’s wide range of stakeholder groups (see also Chapleo and Simms 2010). With relation to sub-dilemma 2, “focusing on international scientific publications vs. focusing on popularisation of science”, the findings of this study are in line with earlier research (Kallio et al. 2016; see also Jauhiainen et al. 2015) in that they highlight the tension between publishing research in English in high-quality international journals and popularising research (e.g. by writing articles intended for the general public in Finnish). Academics are increasingly pushed to use the English language in their research publications, which is reducing the role of the Finnish language in science. This results in less knowledge accessibility for sectors outside academia and hinders the university’s third mission in terms of knowledge transfer. Finnish universities’ current funding model also appears to hinder knowledge transfer, as popularisation of research is not really rewarded by performance measurement and was described by the respondents as not advancing one’s academic career, but actually hindering it (see also Kallio et al. 2015; Ylijoki and Henriksson 2017). External funding schemes were described as having overly short timelines and too much competition, which was related to ineffective communication and knowledge transfer (see also Nokkala et al. forthcoming). The reconciliation process of sub-dilemma 2 could, thus, be labelled here as: “Improving science communication and related incentives”. Hampden-Turner’s (1990) examination of R&D projects and funding processes detected problems similar to those found in the current study (see also Ylijoki and Henriksson 2017). Funding bodies in Finland and at the European Union (EU) level have attempted to reduce bureaucracy’s hindering of funding instruments in R&D projects between universities and other sectors (European Commission 2017; Kivistö et al. 2017; Ylijoki and Henriksson 2017). However, as transparency, legitimacy and reliability remain key organisational values of the public sector, to which universities belong, bureaucracy is still alive (e.g. Kuoppakangas et al. 2013). More attention should be paid to the usability of research results when making funding decisions. In this vein, Finnish doctorates’ perceptions in our data are in line with Gera’s (2012) notion that scientific research needs notable translation and absorption for practitioner use and is, thus, of limited practical utility. Our results support prior studies suggesting that “knowledge transfer” (e.g. Gera 2012) is too narrow a term for describing a university’s expected contribution to wider society. Instead, it is more useful to speak about “knowledge co-production” (e.g. Osborne and Strokosch 2013; Rossi et al. 2017) between academia and industry, as co-production encompasses two-way communication and the joint production of a mutually valued outcome. This notion comes close to one of the central ideas in Hampden-Turner’s (1990) core dilemma reconciliation process: “the environment will reap more from the universities if it sows more, and will sow more if it is helped in its reaping” (p. 214). This study contributes to the intersection of academic literature on higher education management and university marketing by adopting a dilemma approach and collecting empirical data from a neglected group: doctorates who have exited academia (see also Haapakorpi 2017). Although the prior academic literature appears to have omitted this exit group, doctorates who have exited academia play a key role in examining knowledge transfer processes through their movements between universities and surrounding society. In the current study, the data analysis revealed that the core dilemma detected by Hampden-Turner (1990, pp. 213–215), “[t]he enhancement and protection of university’s basic mission to teach and develop ‘pure’ knowledge vs. the need to apply its knowledge so as to help the whole nation compete economically”, is still relevant. Moreover, the data analysis revealed two sub-dilemmas within the core dilemma, which allowed us to draw a picture of the phenomenon in contemporary higher education. It should be noted that the core dilemma (Hampden-Turner 1990) and the two sub-dilemmas are not separate from one another; instead, they are overlapping. Thus, their reconciliation processes found empirically in this study are also overlapping. This is in line with Hampden-Turner’s (1981, 1990, 1999, 2009) dilemma approach, in which one successful reconciliation process may solve other dilemmas and possibly even create new dilemmas requiring reconciliation. An unsuccessful reconciliation process may also create new dilemmas. Thus, reconciling dilemmas is an on-going strategic management process (Suomi et al. 2014). Thus, this study finds that detecting and reconciling dilemmas is a continuous strategic managerial endeavour. There is not one single definite solution to a dilemma; instead, “resolve means to solve again and again” (Hampden-Turner 1990, p. 20). Dilemmas do not disappear by reconciliation; instead, they may represent themselves in different forms and varieties, as highlighted in the current study. However, successful reconciliations to dilemmas may result in new innovative outcomes (Hampden-Turner 1990, p. 20; see also Kangaslahti 2007; Kuoppakangas 2014; Suomi et al. 2014; Laine 2018). This study has illuminated the managerial dilemmas connected to universities’ third mission and suggested related dilemma reconciliation processes (see also Hampden-Turner 1990). Business and industry have in-house education and hands-on knowledge that are valuable and can be utilised in university teaching. Conversely, the research and knowledge produced by universities can be applied for private, public and third sector needs. Students should be taught and should learn during their studies how to utilise research results in professional tasks when they work outside academia after graduation. Universities should actively maintain and develop university–alumni relationships. They should carefully define their key stakeholders, develop relations with them and enhance co-production with and by them. A more holistic marketing approach includes direct and tailored science communication and marketing to other sectors. This study was conducted in one European country, Finland, where universities are publicly managed and state-funded. Thus, the results of the study are best applicable in other Nordic countries. One should also note that answers from different disciplines cannot be statistically generalized. Future studies could expand the view provided in this study by examining dilemmas facing universities third mission in the context of other university systems and funding schemes. The authors wish to thank “Exiting academics in networked knowledge-societies -research project and Academy of Finland for funding this study. Academy of Marketing (2018). Marketing of higher education SIG. Retrieved from https://www.academyofmarketing.org/sigs/marketing-higher-education-sig/. American Marketing Association (2018). Marketing for higher education SIG. Retrieved from https://www.ama.org/academics/Pages/HIgherEducationSIGGeneralInformation.aspx. Coffey, A., Holbrook, B., & Atkinson, P. (1996). Qualitative data analysis: Technologies and representations. Sociological Research Online, 1(1) https://journals.sagepub.com/doi/10.5153/sro.1. Nokkala, T., Siekkinen, T., Kuoppala, K., & Pekkola, E. (forthcoming). Working outside academia? Perceptions of early-career, fixed-term researchers on changing careers. European Journal of Higher Education. https://doi.org/10.1080/21568235.2018.1548941. Podoco (2018). Post docs in companies. Retrieved from https://www.podoco.fi/about/. Publication Forum (2018). Publication forum. Retrieved from http://www.julkaisufoorumi.fi/en/publication-forum. Zomer A., Benneworth P. (2011) The rise of the University’s third mission. In J. Enders, H. F. de Boer, D. F. Westerheijden (Eds. ), Reform of Higher Education in Europe (pp. 81–101). SensePublishers. https://doi.org/10.1007/978-94-6091-555-0_6.